Double pointed metal, plastic and bamboo knitting needles available in 20cm (8in) and 15cm (6in), which are ideal for sock knitting and smaller projects plus and extra short 10cm (4in) lengths. Brands inc Addi, Prym, Clover and Twilley's with sizes from 1.25mm to giant 12mm - ideal for superfast, superchunky hats with no sewing up! Try the shorter length for sock knitting - you'll be amazed how much quicker and more comfortable they are. Bamboo double pointed needles can help to reduce stiffness in hands and wrists, though the needles may bend to fit you over time. 20cm steel double pointed knitting needles from Prym range in size from the finest 1.25mm - 3mm. Please note they are heavier than aluminium needles. 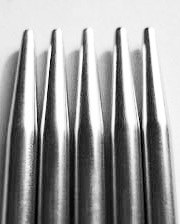 Packs contain 5 needles. Addi 20cm metal double pointed knitting needles in steel are ideal for sock knitting. Please note that they are heavier than aluminium. 15cm double pointed needles from Addi made with high quality Aluminium in light grey. Smooth to touch and easy to knit with with 5 needles per packet. Double pointed knitting needles, 20cm (8in) long with sizes from 1.5mm - 12mm. Up to 5mm needles are aluminium and above are plastic. Prym packs contain 5 needles, Twilleys, 4 needles. We stock Prym wherever possible but we may substitute Twilleys according to availability. 20cm premium double pointed bamboo knitting needles from Addi with 5 to a pack. 20cm (8in) long.